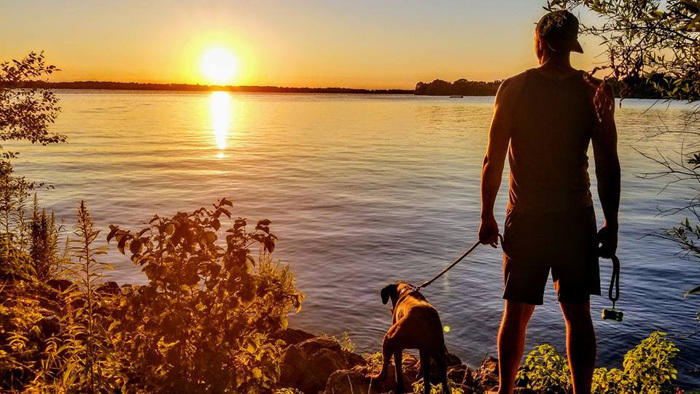 As it turns out, adventure is everywhere – even within. When you come and visit us, you might notice the sunny smile (and super-cool world-map shoulder tattoo) of one of our superstar team of skydiving instructors. You should stroll up and introduce yourself! That’s Luke Pinion. Not only is he a big-hearted charmer, but his backstory is fascinating. He’s one of our favorite skydiving success stories, and we can’t wait to tell you all about him. 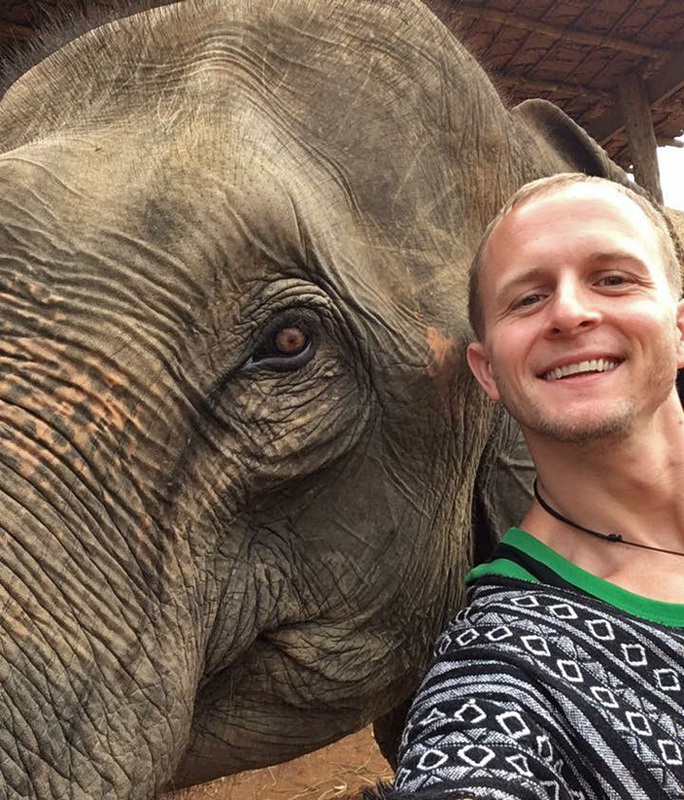 Luke takes a selfie with an elephant on an adventure in Thailand. 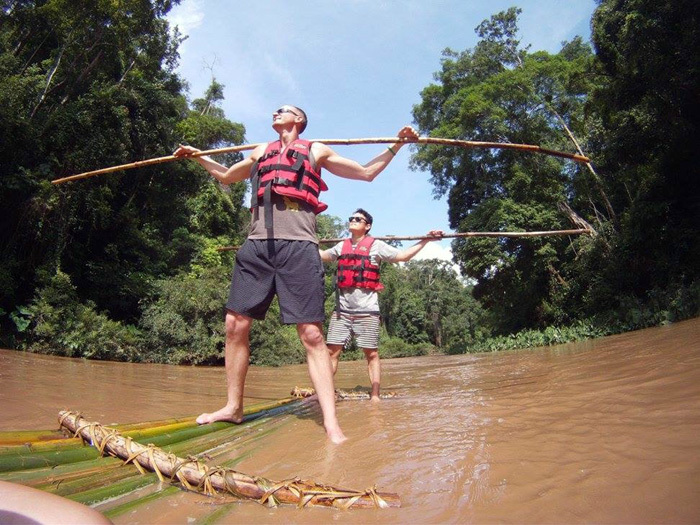 Luke discovered his penchant for adventure in high school, albeit in a non-traditional manner. For the most part, he was a uniquely busy kid with little in the way of time and resources for travel. He’d been working since he was 12 – babysitting, then a bus-boy, bagger, cashier, customer service specialist, optician, anything that paid – to supplement living in a low-income household. It took what amounts to divine intervention to show him the world outside his little hometown. Despite the far-flung journeys he was undertaking, skydiving was nowhere near Luke’s radar in high school. 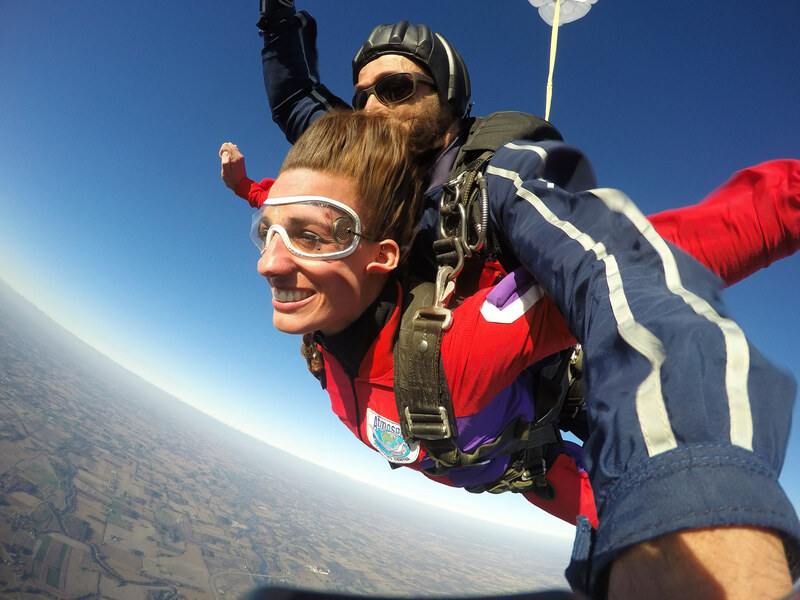 It was only upon his graduation – when Luke’s brother bought him a tandem skydive as a graduation gift – that it became a reality. Two weeks later, Luke moved to college for his freshman year. With a little research, he found out that there was a skydiving center nearby, so he went and checked it out. Lucky for us, that little dropzone was ‘Atmosphair’ – the facility that would later become the Wisconsin Skydiving Center. Alex [Kolacio, Co-Owner of WSC] greeted Luke, and he told her his story. Luke did his first AFF jump in September 2002, along with a not-so-whopping class of two other students. He jumped as much as he could before the end of the semester but didn’t quite finish his A license before winter hit. He paid to stay in the college dorms instead of heading home for Spring Break, determined to finish the program. Victorious, Luke finished his A license that freshman year, right as he turned 19. All the while, Luke was proving the mettle of his impressive work ethic by cranking out a hectic academic schedule. He earned not one but two Master’s degrees – a Master’s of Science in Education for School Psychology and an Educational Specialist in School Psychology. He also returned to grad school for another year after that to receive his administration license. 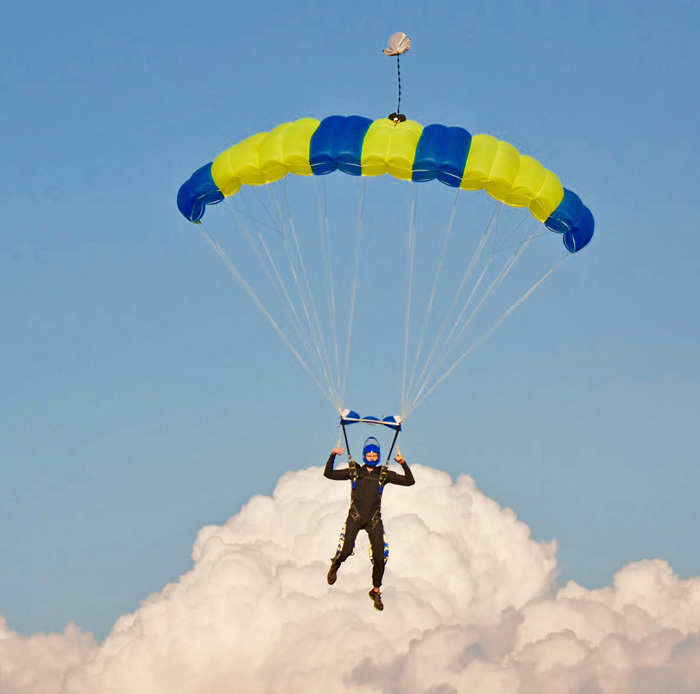 He spends his weekends with us as a skydiving instructor – and, when time allows, jumps for fun as well. When you ask him, Luke explains that there are plenty of parallels between skydiving and his richly rewarding professional world. 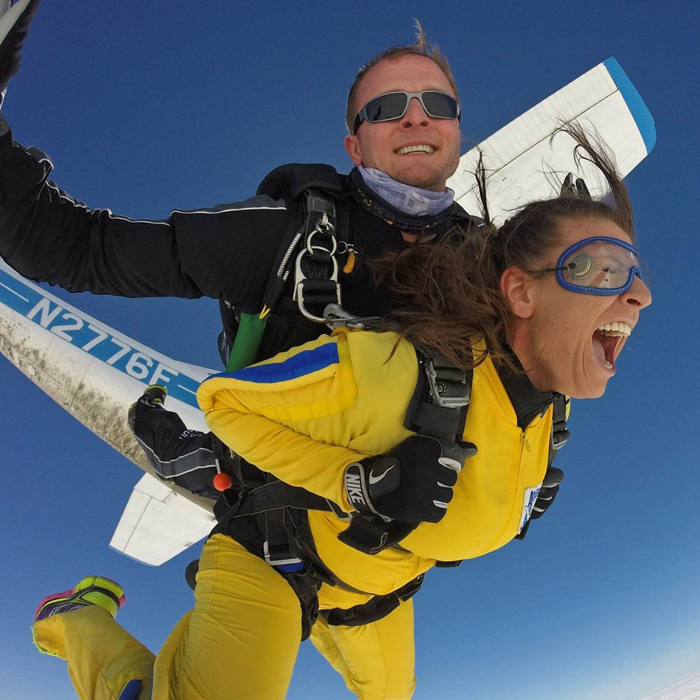 “I never wanted to be a tandem instructor, but I had been an AFF instructor for a few years and wanted to keep growing as a person and as an athlete, so I decided to earn my tandem instructor certification,” Luke explains. As far as the future, Luke is looking forward to spending many, many more days as a skydiving instructor helping to introduce new jumpers to the wonders of the sky at the Wisconsin Skydiving Center – and, if you’re aiming to be one of them, he has some predictably sage advice for you.